I remember when Kevin hired Matt (pictured in the middle), who was just 19 at the time, back in 1999, to be in charge of Preventative Maintenance. The office staff, myself included, quickly took a liking to him, and we all not only went out of our way to mother him, but we also peppered him with our sage wisdom. Over the years, we watched Matt grow into a responsible man, a talented mechanic, a devoted husband, and a doting dad. Those last two are especially important given that he married the boss’s daughter! 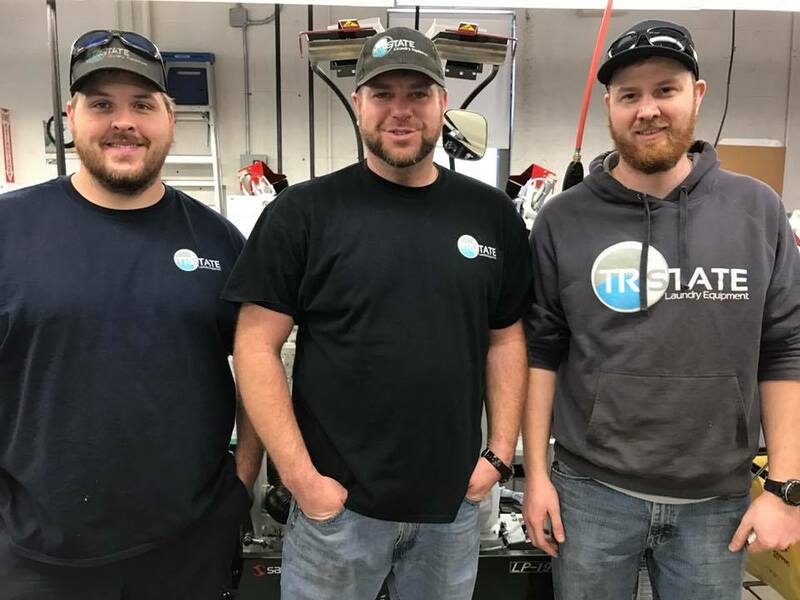 In 2015, a dry cleaner in Raleigh experienced a devastating fire, so Tri-State installed an entire plant’s worth of new dry cleaning equipment in a temporary location. Just a short time later their new facility was completed, so Tri-State then moved and reinstalled the equipment at the new store. He spent about a year practically living in Raleigh. Then there was the time a broken-down boiler installed in a boiler room was too large to take out through the doorway, so Tri-State had to bring in a crane to remove the old one through the exhaust hole in the roof as well as bring in the new boiler the same way. Lately, Tri-State has been doing equipment work in Maine with a few linen and uniform companies in dealing with massive washing machines that are 80 feet long. Matt said it is hard and heavy work, and I hope to share more about that in our next post.